Calendar of Acts passed this Sessions. AN Act touching Letters Patents and other Writings to be signed by the Queen. An Act for Reformation of Excess in Apparel. An Act against seditious Words and Rumours. An Act for the Punishment of certain Persons, calling themselves Egyptians. An Act to restrain the carrying of Corn, Victual, and Wood, over the Seas. An Act for the reviving of Three Statutes, made for the Punishment of Heresy. An Act, That Persons, dwelling in the Country, shall not sell by Retail divers Wares in Cities and Towns Corporate. An Act, repealing all Statutes, Articles, and Provisions, made against the See of Rome, sithence the 20th Year of King Henry the Eighth; and for the Establishment of Ecclesiastical Possessions conveyed to the Laity. An Act for the Punishment of Traiterous Words against the Queen. An Act, whereby certain Offences be made Treason. An Act for the Punishment of bringing in of counterfeit Coin of Foreign Realms, being current within this Realm. An Act, touching the Impounding of Distresses. An Act, appointing an Order to Justices of Peace, for the Bailment of Prisoners. An Act for the making of Russetts, Naples Fustians, and Sattins-Reversies, in Norwiche. An Act to confirm the Liberty of the Lords Marchers in Wales. An Act touching Leases hereafter to be made by Spiritual Persons. An Act for the Restitution in Blood of the Lord Cardinal Poole. 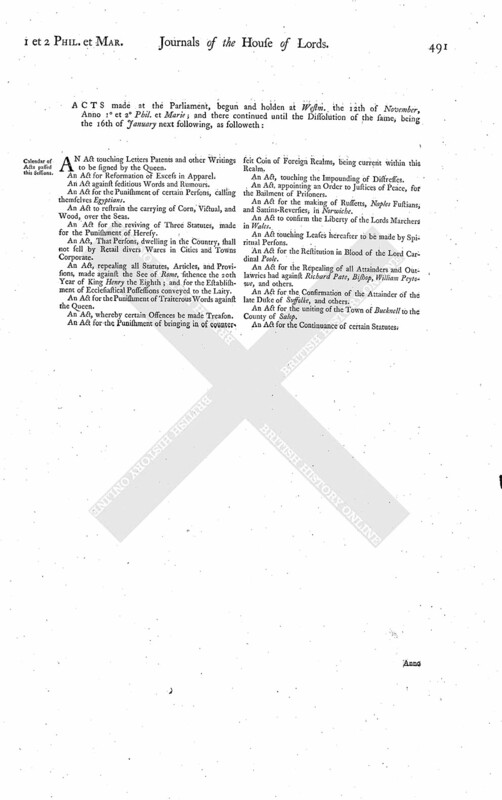 An Act for the Repealing of all Attainders and Outlawries had against Richard Pate, Bishop, William Peytowe, and others. An Act for the Confirmation of the Attainder of the late Duke of Suffolke, and others. An Act for the uniting of the Town of Bucknell to the County of Salop.